Jim Chapman says there is no reason his team can’t get a win when they travel to top of the table Stirling Albion. The Bully Wee will face an unbeaten so far this season Albion side. 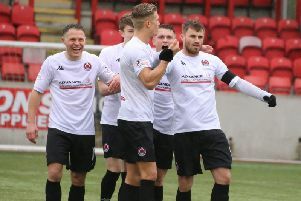 Chapman is adamant that they will not be fazed by their opponents, but admits the game is a good chance to compare Clyde to the strongest competition in the league. Chapman said: “I think they’ve set a good standard. It’s a chance to compare ourselves to them. “They’re a good team, but we won’t be intimidated by them. At the end of the day, if you score more goals than them you get the points. It’s all just basic logic but there is no reason we can’t go to Stirling and pick up the three points. The Bully Wee secured three new players on the transfer deadline day last week: 19-year-old winger Mark Lamont from Partick Thistle on a development loan until January; Motherwell goalkeeper Peter Morrison, again on a development loan, and defender Andy Munro on loan from Forfar Athletic. But new signings won’t get a free pass into the squad.